February is National Heart Month. Seems fitting…heart and love in the same month. A fellow heart mom, Jade, has been posting lots of information about CHD (congenital heart defects). This got me thinking that I should inform others about Eli’s heart condition and share his story. Grab a drink and a snack – it’s quite a story!! 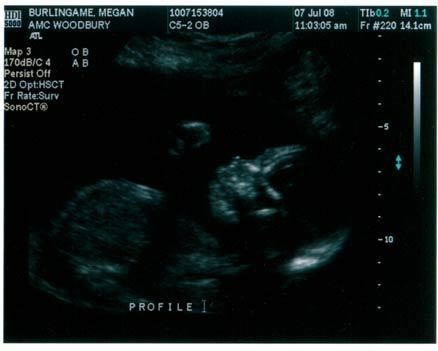 In July of 2008, I had my first ultrasound. Dave and I were so excited to “see” our baby for the first time and learn if we were having a boy or girl. We had just found out the week prior that Nate and Sarah (Dave’s brother and wife) were having a little girl. Of course we all wanted to know what Baby Girl was going to have for a cousin and playmate. Much to our elation, we found out Baby Girl was going to have a Baby Boy cousin! We were so thrilled and talked excitedly about our Baby Boy. We were so busy in our conversation that we didn’t notice the technician’s concerned face or the fact that she was taking lots of pictures of his heart. Our first ultrasound of Eli, he was such a busy boy punching his Momma’s insides. Later that afternoon while I was at work (I was working at the Bell Museum as a director and science camp counselor), my doctor called me. After the 3rd missed call and urgent voicemail, I decided I should call her back. Our conversation was brief and heart-stopping. 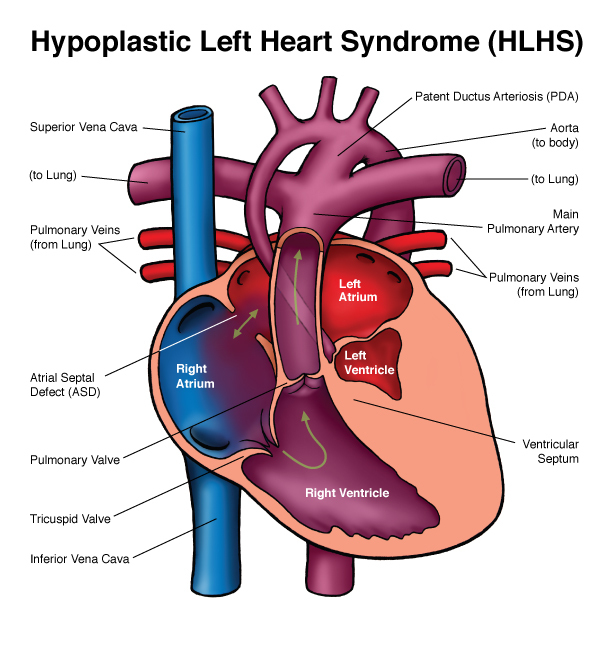 She said the radiologist believed that Eli had something called “hypoplastic left heart syndrome”, we had another ultrasound scheduled for 2 days later to confirm the radiologists suspicions. I vaguely remember asking some questions and her telling me to not research information on the internet. I didn’t know what to do, I was so scared for my baby boy. I couldn’t call Dave, he was working at FedEx at the time and unable to take calls while driving truck. I called Mom and told her about Dr. Gurney’s call. She was very comforting over the phone and prayed for me. Belly shots – my growing babe. That night we were suppose to have dinner with Nate and Sarah at their place (they lived just a few miles away). I remember going to their apartment and being so angry with them. 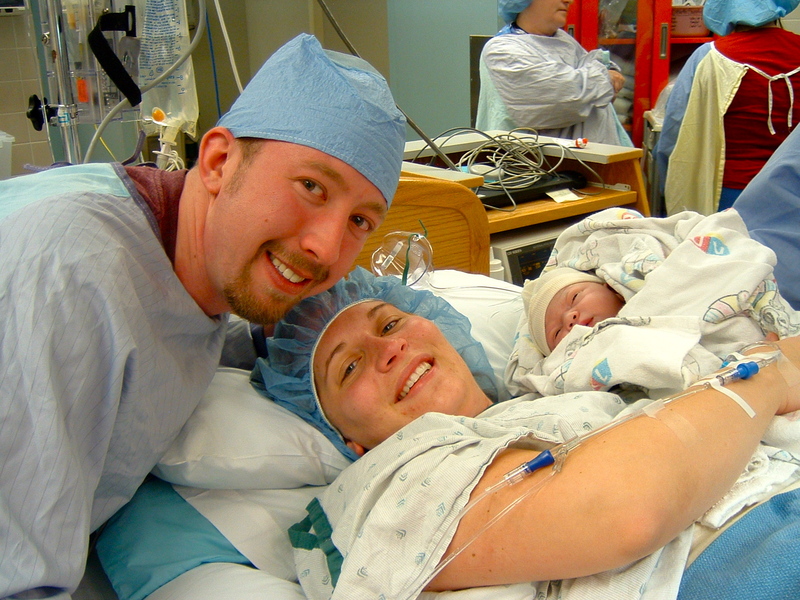 Their little girl was perfectly healthy and my baby wasn’t. Of course this was not fault of theirs, God made each child the way He did for a specific reason, but I was still angry. I tried so hard to not show my anger and frustration, I hadn’t talk to Dave yet so I didn’t want to share my feelings with them. After telling Dave the news and crying with him, he told his family what was up and told me that God was going to heal our little boy. One of the moments, during my pregnancy, where I felt absolutely beautiful. 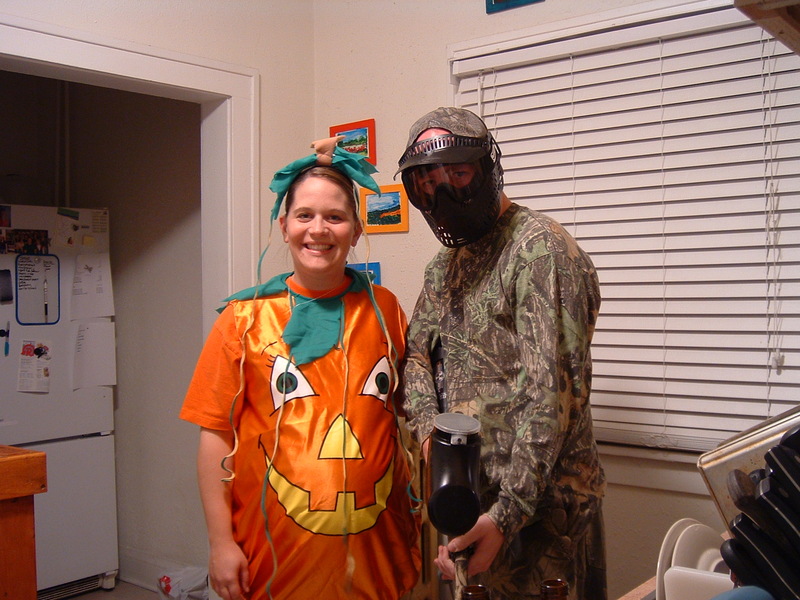 Halloween – the first time I’ve ever been able to naturally fill out my pumpkin costume. Dave was my personal sniper – didn’t want those bunnies to be nibbling on me. We were also seeing our pediatric cardiologist each week to follow up on my pre-natal care and the BPP reports. It was daunting to see him as well, but he was so encouraging and supportive. Dr. Rios was our second cardiologist, the first one gave us 3 options and they all ended in death. We didn’t like his options so we left and never returned. Dr. Rios was encouraging, supportive, honest and so helpful. He listened to our fears and concerns, he didn’t downplay any of our emotions and answered all our questions (no matter how dumb sounding they were). We still see Dr. Rios and still absolutely LOVE him!! 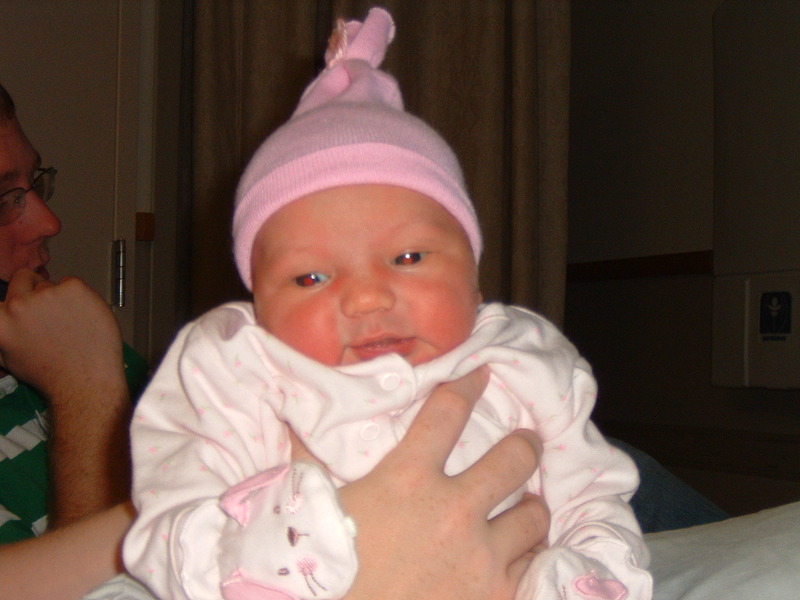 Our sweet niece, Alexis Grace, made her debut one week before Eli. After many weeks of great reports, we were playing the “wait for the baby to come” game. While we were waiting, our niece decided to give her momma a bit of a rough labor before coming into the world. We were having bible study at our apartment when we got the call she was here. We promptly kicked everyone out and headed to the hospital to meet her. :-) She was cute and chubby! Look at those cheeks!!! I had a pre-natal appointment on November 10th, Dr. Gurney informed me that she talked to Dr. Rios and I was going to be induced the next day. I called Dave and told him that he needed to come home from his hunting trip because were going to have a baby!!! Eli Mathias Burlingame – born November 11th. Weighed in at 8lbs 10oz and was 22 inches long. 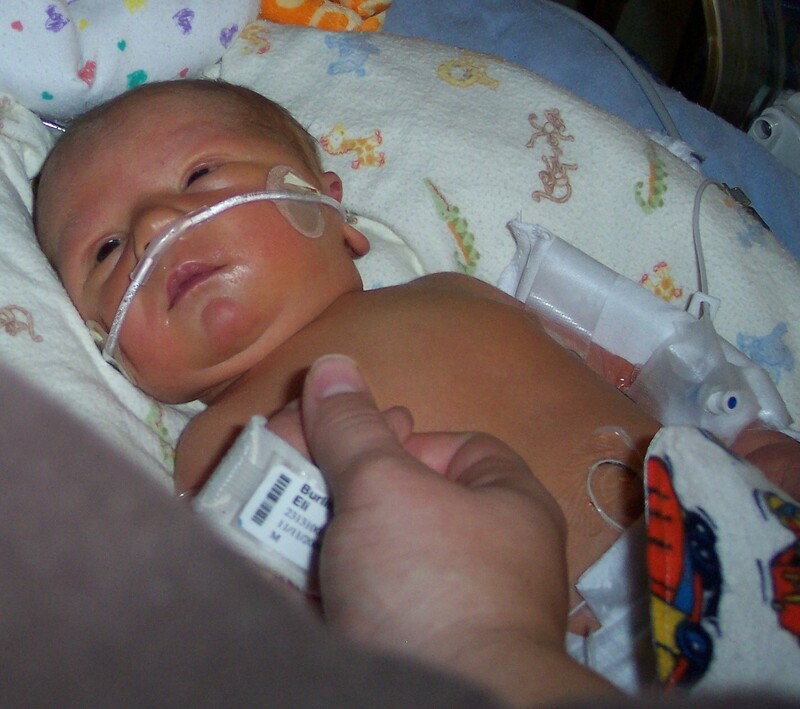 Prior to giving birth we had a plan — there was a good chance that I was NOT going to be able to see or hold Eli before they needed to get him to the NICU. Our plan was for Dave to go with Eli, while Mom came into the room with me to be with me while I was “finishing up”. Then we were all going to see Eli together. Well, God had a different plan. Not only did I get to see my baby boy, I got to hold him and take a family photo. Thank you Jesus!! Seeing my baby boy for the first time and commenting on his chubby cheeks. Eli and I were discharged the same day. However, Eli was “discharged” to another hospital. He was moved from Children’s in St. Paul to Children’s in Minneapolis. All the cardiologist surgeries happen at Children’s in Minneapolis. He recieved fantastic care while in the hospital. We were so pleased with the doctors and nurses. They allowed us to be hands on and super involved, which warmed our hearts and let us feel useful. Being hands-on made his hospital stay easier to handle. It was so hard to be separated from my baby, but I loved being a part of his care while at the hospital. He opened his eyes for us, this was the first time we fully got to see his eyes and take a picture. 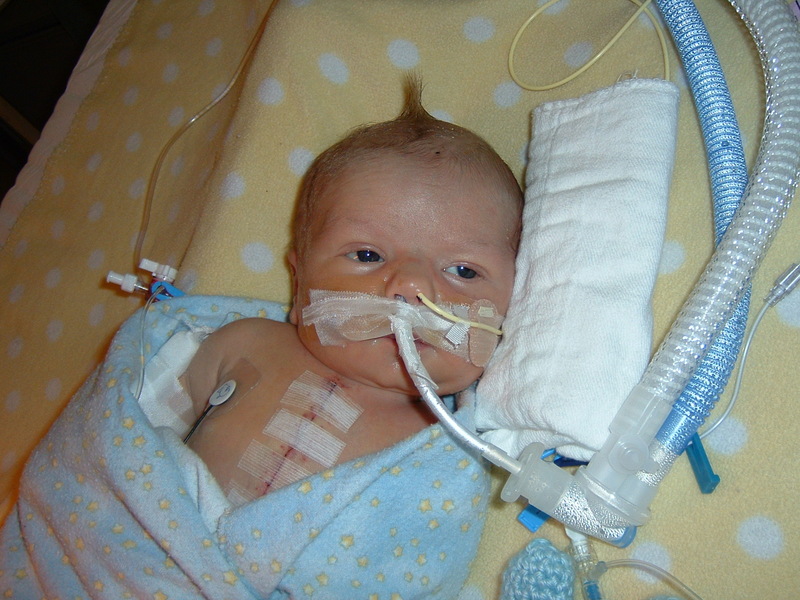 In the 10 days after his birth and before his surgery, I was preparing my heart for Eli to die during surgery. I was scared to become more attached to him. I had so many people praying for me and for Eli, which is exactly what we needed. We were able to walk him to the OR doors on the morning of his surgery. As soon as the nurse took him from my arms, my tears stopped and I turned to Dave and said, “He’s going to be fine. God has him.” A complete sense of peace had washed over me. I knew my little man was going to be just fine. My heart opened and love just filled it right up. Thank you Jesus and thank you prayer warriors! My super tough little man, battle scars and a mohawk! After his surgery, his chest was covered, but still open. Due to the amount of swelling, they didn’t want to close him up right away and cause further damage. They kept him sedated and calm. His favorite nurse (ours too) gave him a mohawk the day after his chest was closed up. She said tough little babies need mohawks. :-) The hardest part was not being able to hold him for 8 days. 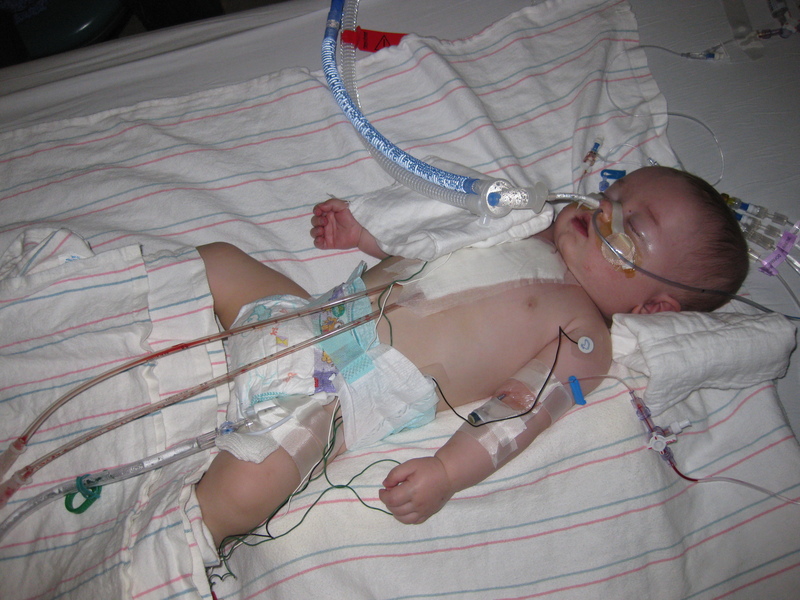 While he was hooked up the ventilator, we were unable to hold him. We could touch him, talk to him, sing to him, read to him, etc. but not hold him. My arms were aching to hold my baby boy. Eli thrived after his surgery and did a fantastic job of healing and getting better. 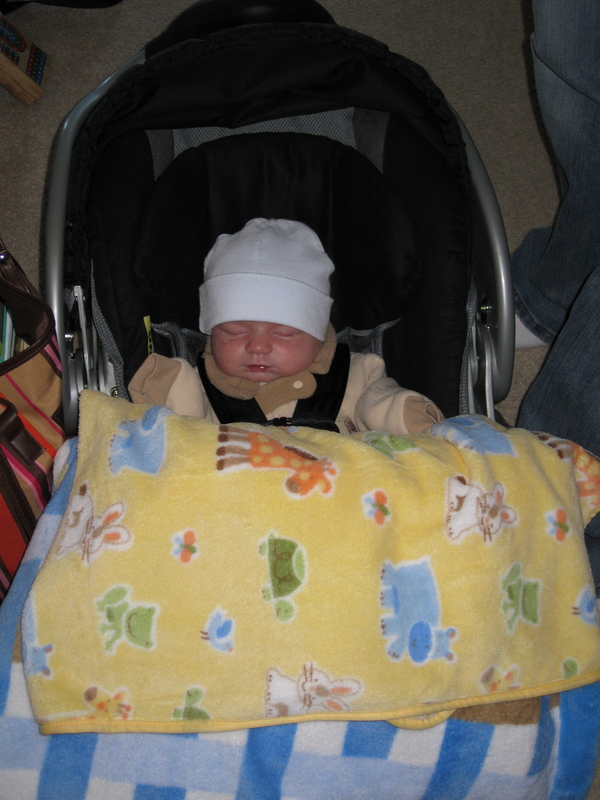 One month after he was born, we were able to take him home. Yay!!! I had 4 weeks of maternity leave left and I was super pumped to spend them at home with my boy. Getting big, strong and doing lots of healing!! His scars look fantastic! Eli never figured out how to nurse, so I ended up pumping for 8 months (talk about dedication and love). He had a great milk supply going in our freezer. 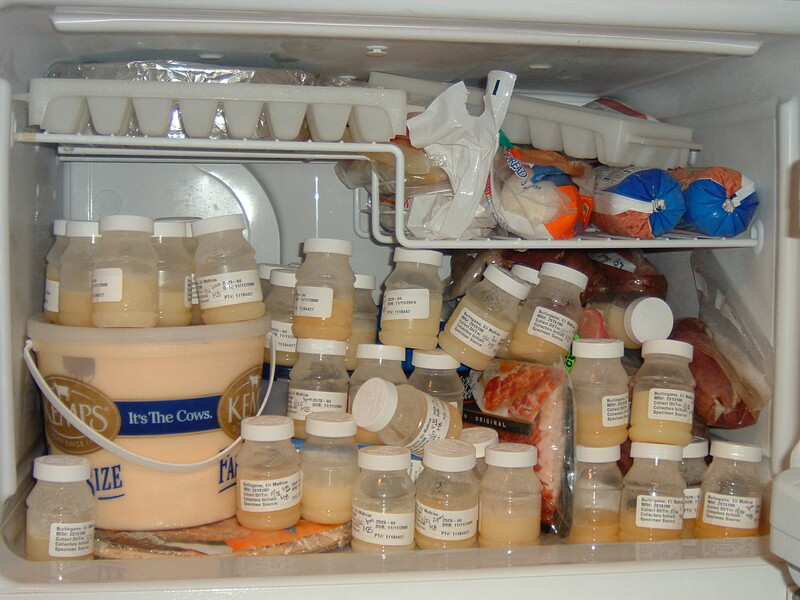 He was unable to “eat” for about 3 weeks, so in that 3 weeks I created quite the stockpile. We had to use hospital issued bottles for my breastmilk. They took up a lot of space. 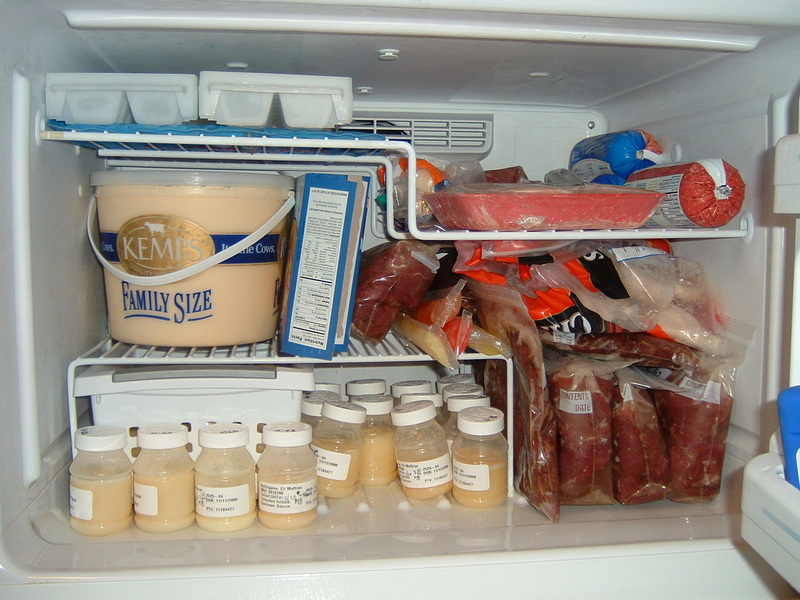 Dave felt compelled to organize and take back control of our freezer. We had an insane amount of milk and small bottles. Due to Eli’s inability to eat for those weeks and our need to supplement after he came home, my milk supply lasted until he was 10 months old. Whoop whoop! Eli was a busy boy! He loved to play, visit with his cousin and other family and friends and snuggle. He did not learn how to lay on his tummy and hold his head up until he was 6 months old. He also did not like to stand on his feet, he always kept them tucked up underneath him. Otherwise, he was a super happy and sweet baby! Eli had his 2nd open-heart surgery on April 6th, Auntie Sarah’s birthday. This procedure was called the “Glen” procedure. This is what Mayo Clinic has to say about the Glen, “this procedure is typically performed between 4 and 12 months of age. It reduces the work of the right ventricle by allowing it to pump blood mainly to the aorta and allowing most of the blood returning from the body to flow directly into the lungs. After this operation, all the blood returning from the upper body is sent to the lungs, so blood with more oxygen is pumped to the aorta to supply organs and tissues throughout the body“. Just hours after his 2nd open-heart surgery. Eli bounced back much faster after this surgery than the first surgery. He was off his ventilator that night and the chest tubes were out with in a day or so. We were able to hold him almost right away. Amazingly enough, we were home 6 days after his surgery. It didn’t seem possible, but we were not going to complain. We wanted to be home and not in the hospital. The cardiologist in charge at the time, Dr. Singh said, “People recover better at home. Go home!”. 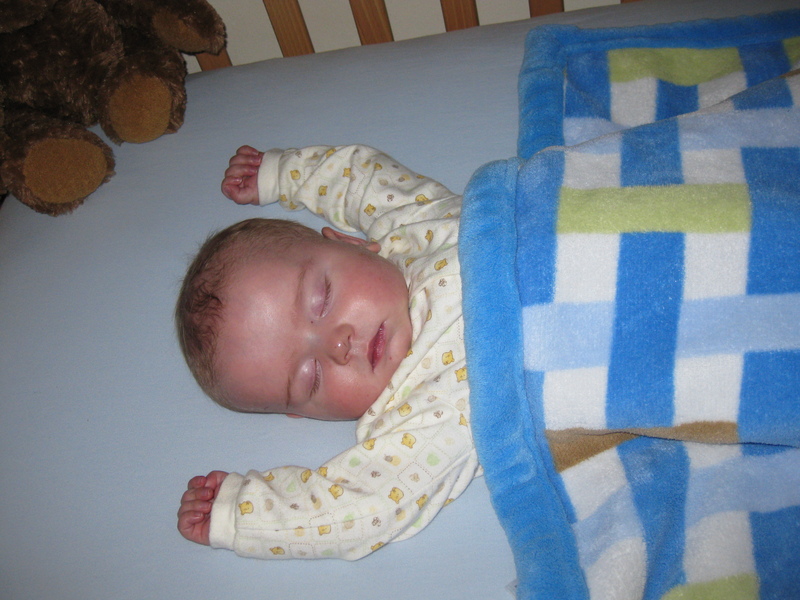 6 days after open-heart surgery and he’s sleeping with his arms over his head. We came home from the hospital on Easter Sunday, Dave got sick that afternoon and was sick for 3 days. Eli and I spent our time in the living room avoiding Dave. I had no more time to take off from work, so Eli went to daycare for two full days 8 and 9 days after open-heart surgery. Amazing!! We were so fortunately that he was going to a good friend’s house. It was just Eli and her two little boys. They were super careful and protective of Eli. They took great care of him. 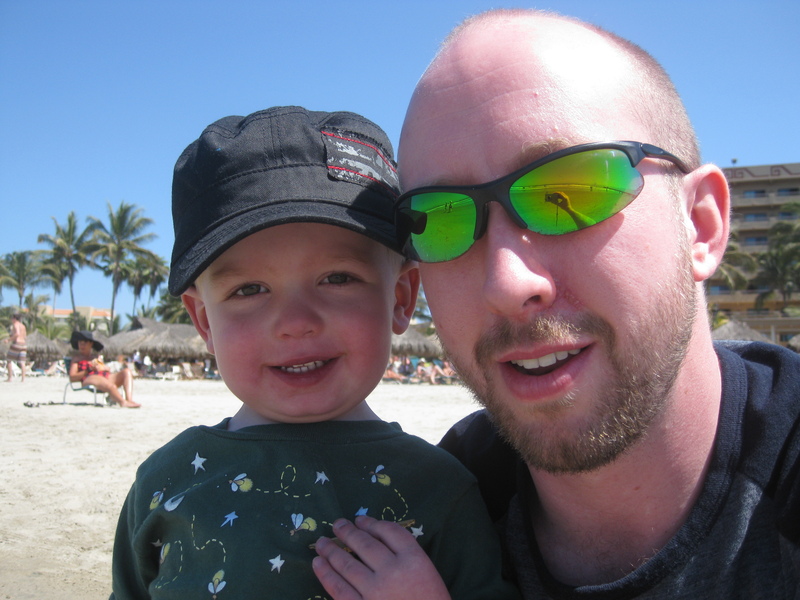 Eli continued to do what he was suppose to do – eat, sleep, grow and thrive. Every cardiologist visit was positive and encouraging. For the most part, Eli developed on pace with his age level. 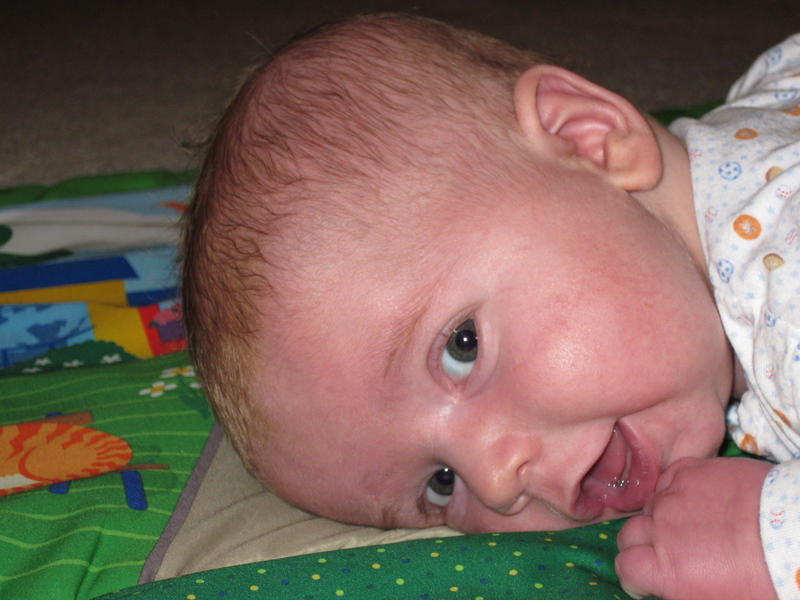 The only area he was behind in was holding his head up while on his tummy (first time on April 24, 2009) and standing on his feet. He went through some occupational therapy to develop this skill. In one day he mastered the skill of: crawling, going from laying down to sitting up and pulling him self up on things. We think he’d been practicing these skills in private before showing us. 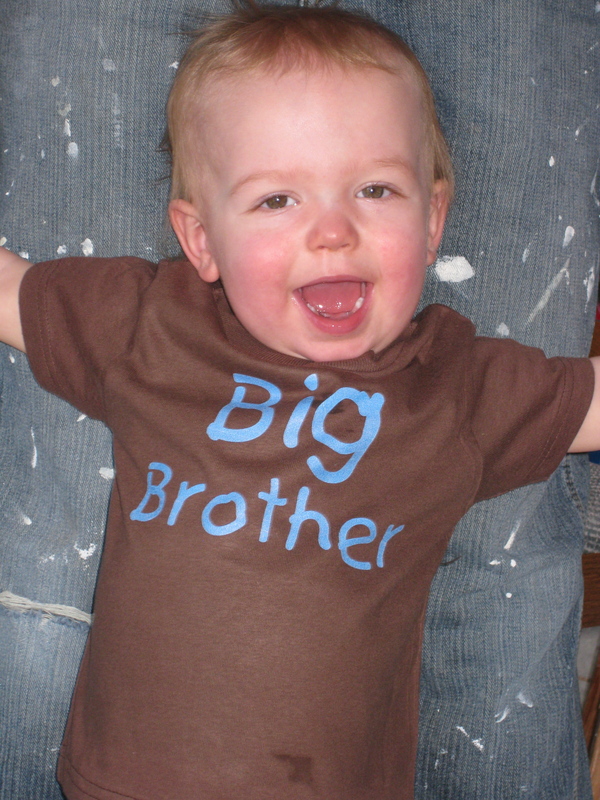 Eli is gonna be a big brother in November 2010!!! This is how we told our family and friends that we were expecting Noah. When he was 15 months old, we found out we were pregnant with baby #2! We sent the above photo to all our family and friends to announce our pregnancy. Everyone loved it! 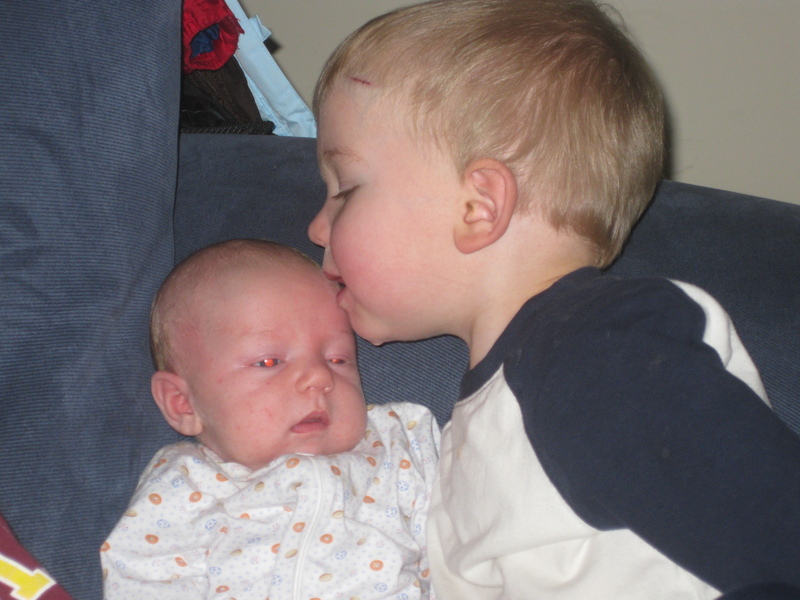 Eli loves his baby brother, Noah. We met with Dr. Rios during the summer of 2010 and decided the 3rd surgery could be done any time the following year, especially around the time that Eli was to turn 3-years old. I requested that the surgery be during the summer so I could be there without taking time off from work. Since Mom was a teacher as well, she would be available to help take care of the baby. Mom and I made plans for her to watch the baby during the day so Dave and/or I could be at the hospital with Eli. Unfortunately God decided to call Mom home on Sept. 15th of 2010. 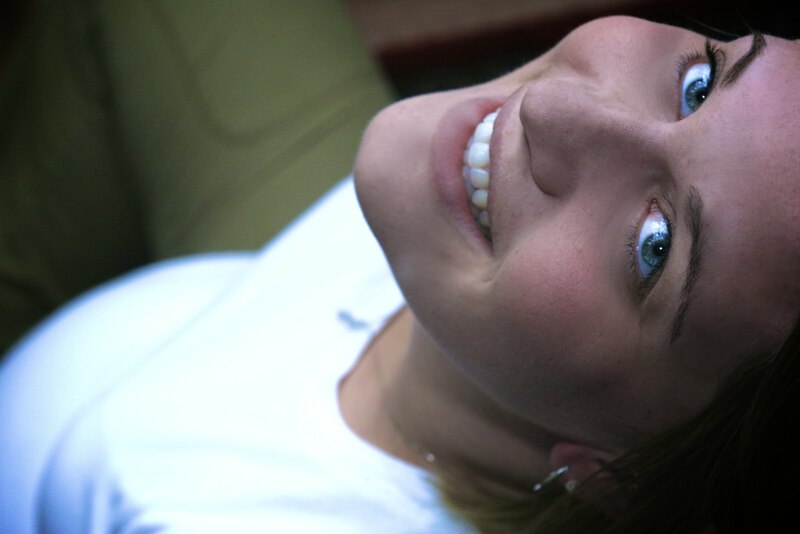 She was tragically killed in a car accident. 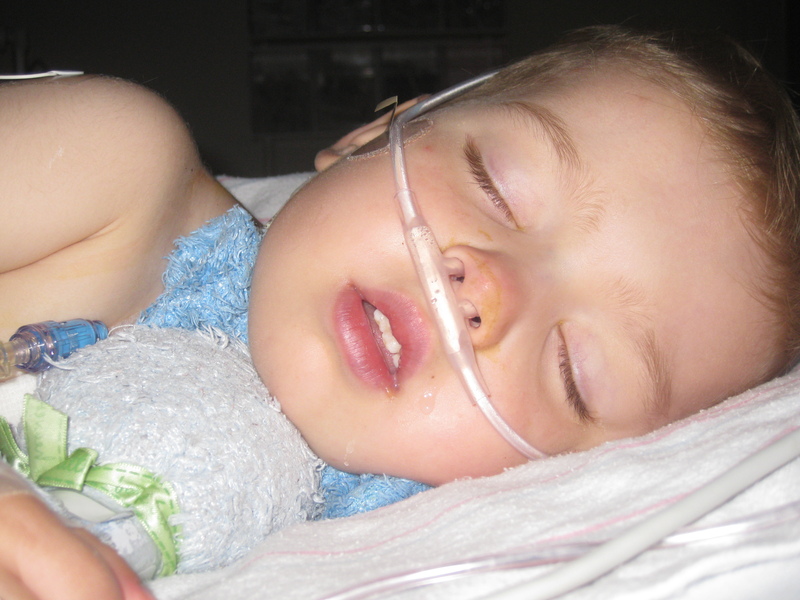 Eli’s final surgery was an emotional roller coaster for so many reasons. With Dave’s parents help, we were able to take a quick trip to Mexico. It was a much needed vacation. 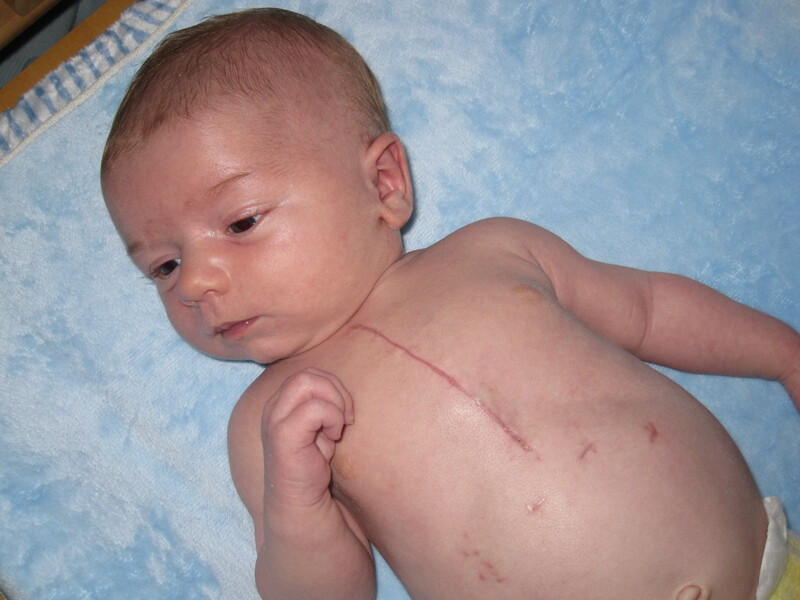 Eli had his 3rd and hopefully final, open-heart surgery on July 12, 2011. 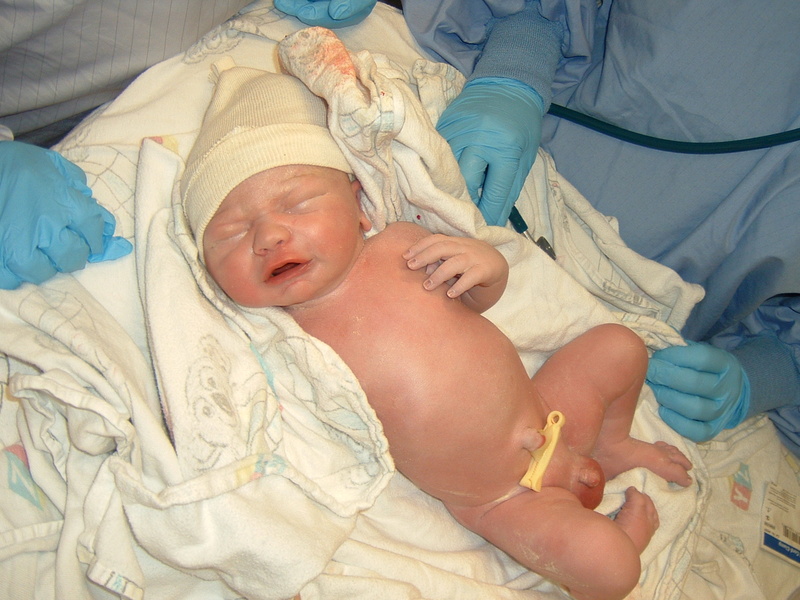 This procedure was called the “Fontan”. Here’s what Mayo Clinic as to say about the procedure, “this procedure is done between 18 months and 3 years of age. It allows the rest of the blood coming back from the body to go to the lungs. After this procedure, there’s no mixing of oxygen-rich and oxygen-poor blood in the heart, and your child’s skin will no longer look blue“. Many people commented on how pink and normal looking Eli was now. This was my view for a hours the day after surgery. He came through like a champ. He healed super well but was going stir crazy in the hospital (we all were). Dr. Rios warned us the longest part of this healing process would be to get all the fluid out of his chest cavity. We spent 2 weeks roaming the 4th floor of the CVCC Unit. Eli ate lots of salty things, his sodium levels were low and Noah took naps in the bathroom. 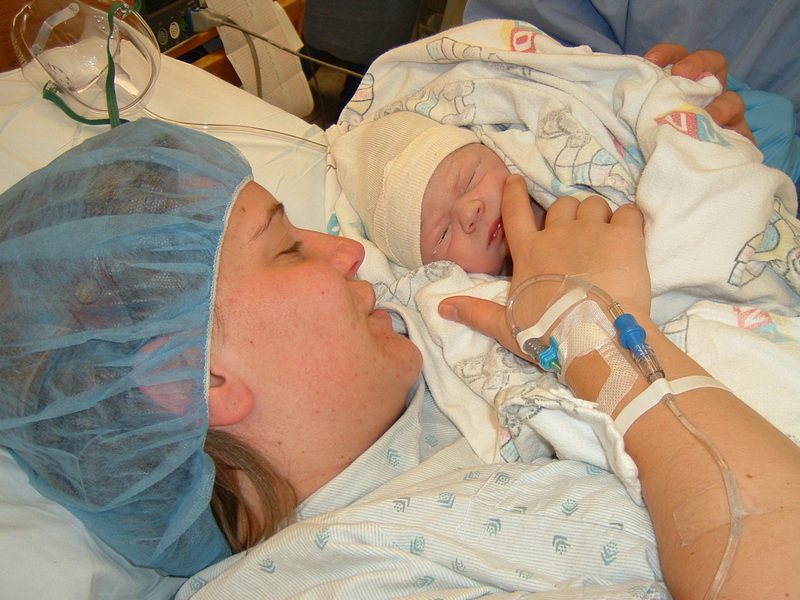 This surgery was the hardest for me – my mom was gone, my baby was hurting and I had another baby who needed me as well. I was stretched and pulled in so many emotional directions. My prayer warriors were so faithful and steadfast in their prayers, love, support and encouragement. They helped pull me through one of the hardest moments of my life. I had no strength to do anything on my own, including praying to God for strength. 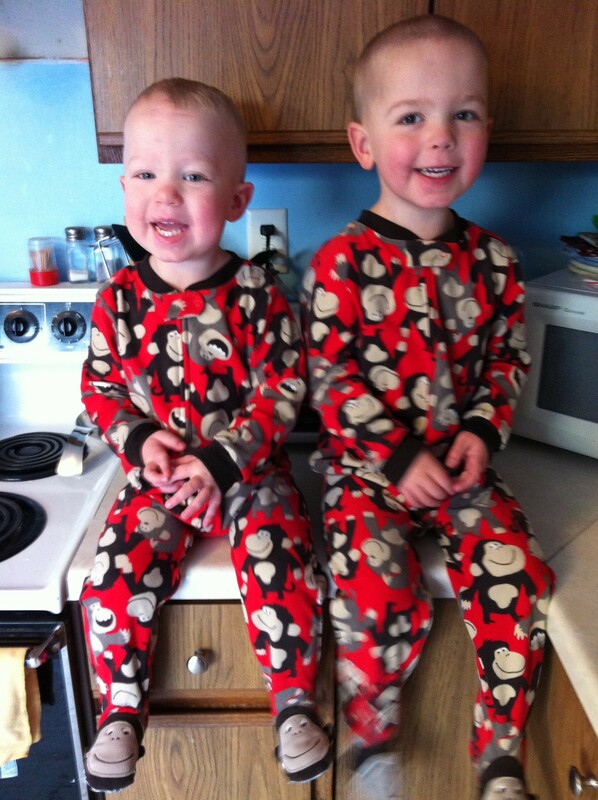 My monkeys – Noah is on the left and Eli is on the right. We are so thankful that God has given us Eli, he is truly a miracle in every sense. Thank you for reading our “heart” story. Have a blessed day!! Thanks for sharing your story Megan. Megan – what an amazing story!! It is true that God never gives you more than you can handle!! He sure did share a lot with you in a few years however, I think it is your turn to have a break and enjoy your family! !